I hope you are doing well. Nowadays, no HYIP programs are surviving for a longer time. Even the most promising looking programs are being scam in a short time. Today I want to write about a program called XABO which is running from 172 days. XABO was started on 29th of May 2016 and added to AlexNews on 11th of November 2016. I’ve reviewed several old programs recently but most of those were started with a “small daily paying plans” and then was switched to high profit paying plan. But XABO is still running on same plan which it was started with. I believe that this program is still able to run for more days. There are some simple logics behind my opinion about XABO. This program was started very silently although some HYIP Monitors has added this program for free from the first. But program admin was not purchased any of HYIP monitors from the first. They have added few monitors on 2nd week after they’ve started and from then they are adding monitors occasionally. On the other hand they are also doing huge advertising nowadays. No doubt that they’re collecting good amount of investors right now. As I think their advertising campaign will run for long time and there are also many popular monitors are remaining to add for promoting their program. Normally, a HYIP program don’t run away when their advertising campaign are running and these kinds of programs always do the best advertising over the HYIP Industry. These logics are simple calculation but may not always happen in real but we have to accept this risk to make profit in HYIP Industry. XABO is offering a flexible earning percentage which is up to 5% daily until you capital reach to 150%. Minimum investment is started from $10. Since last 172 days their average daily profit was 2.98% daily. In this speed it will took around 50 days to reach the capital at 150%. 2.98% is a standard rate but investors can earn more by spending big amounts. From $10 to $1000 investments will get the standard rate and from $1001 to $5000 investments will earn 1.05% more than a standard daily paying rate. If XABO pay 2% profit tomorrow then an investors with $1000+ investments will get 2x1.05 = 2.1% profit tomorrow. We’ve seen many programs which pay variable earning percentage. Fortunately, most of those were run for long time and were a successful program for investors. No doubt that this plans attract big and serious investors but may not attract small investors. However, 50% net profit in 50 days is still an attractive plan and not less than that a standard HYIP pay. This is also profitable for medium investors but keep in mind that there is a minimum withdrawal amount of $1. If you invest too small like $10 - $30 then you may not able to withdraw your earnings daily. By the way, all payouts get processed instantly. 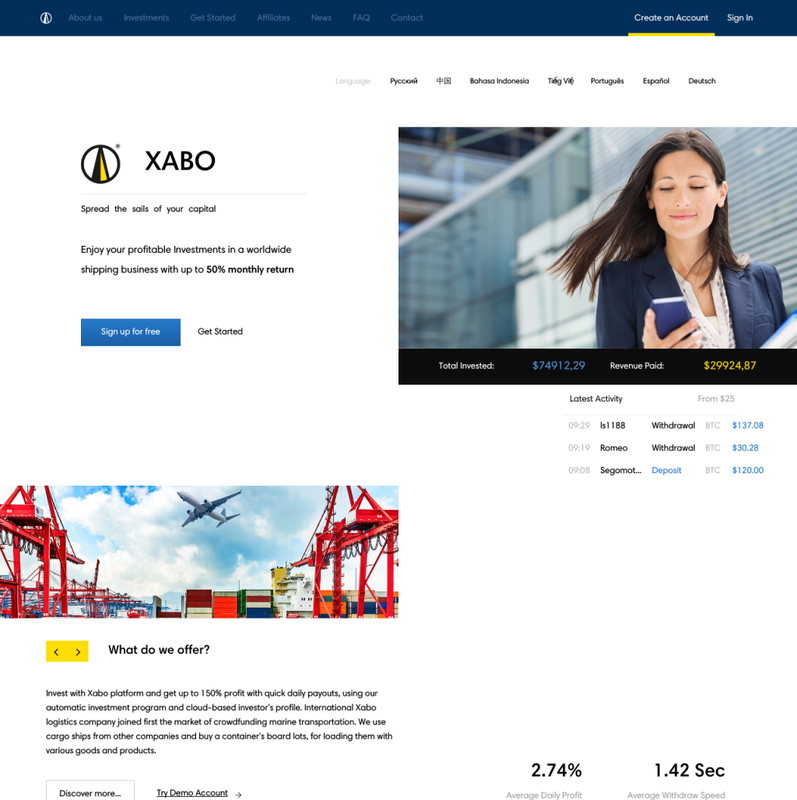 The website of XABO looks ok but missing a background color/image. When I opened their website first time I thought it wasn’t loaded fully but I got confirmed after 2-3 reloads. The homepage has all necessary information including average daily paying rate and details of investment plans. There is a video presentation provided and some video testimonial is available also. The member area is based on a custom made script and it’s designed well. The member area is also provides good details of investments and profit rates. Website is hosted on DDoS Guard which also provides strong DDoS protection. Standard SSL is available but an extended validate ssl could be more impressive. 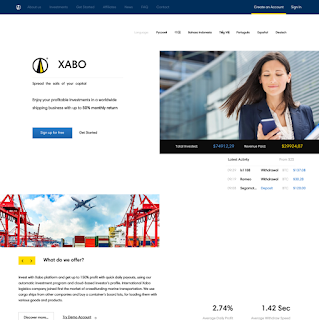 Well, XABO has spent enough money to build their website and now spending for promotional campaign. No doubt that it’s a big budget program. If you are regular in HYIP industry then I’m sure that you have not missed their ads. As I said they’re collecting good amount of investors right now but sometimes huge investors join in a program at once and program admin run away because he doesn’t expect for more money. But right now there are not so many investors exist in HYIP industry and XABO hasn’t collected too enough yet. It may be safe to join this program now but please don’t invest more than you afford to lose.